As I learn more about pre- and perinatal psychology, it’s maddening to consider the easy, kind, human ways we could change scheduled, non-emergent cesareans that would support the physical and psychological health of the family. Of course, I am NOT advocating for scheduled sections for anything other than absolute necessity- a medical condition in the baby that might make labor more dangerous for him/her (these situations do exist), complete placenta previa, and several other conditions. And the gentle cesarean is not without its critics- and I do understand the concerns. However, we’re left with the reality that 1/3 of our first time moms are being surgically delivered. When a cesarean is about to happen, what can be done to preserve the psychological health of the baby & mama? Acknowledging the family’s right to determine any non-surgical factors that do not impact the course of surgey seems a no-brainer. Mom feeling some control over her birth, lowers the chances of PTSD and other postpartum mood disorders. And many of the ‘gentle’ things mom might choose increases the likelihood that mom and baby will have successful bonding and breastfeeding after the fact. Warm the OR so the baby can be comfortable. Lower the lights so make the transition from inside the womb to outside less jarring. Use flamless candles if possible. Play music that is comforting for mom and familiar to baby. Turn down the volume of any monitors if possible to allow family/human sounds to be heard. Have pictures of loved ones in view. Have support people present (partner AND doula). Encourage mom that she’s doing well. Massage mom’s hands with essential oils to release scents she enjoys and finds relaxing. Lower the drape when the baby is born so mom can see her child emerge. Hand the baby to a nurse whose hands are sterile (to prevent contaminating the doctor’s gloves) and have nurse place baby directly on mom’s chest. Do all newborn monitoring on mom’s chest. Encourage and support breastfeeding on the operating table. Respect mother’s wishes in regards to the disposition of her placenta. Have photographer capture special moments. Have Dad cut the cord (after it stops pulsing, of course). Have Dad announce gender if it is unknown to the parents. Ask Dad to give input into the birthing space. Assist Dad to give baby a warm bath when mom and baby are ready. Have the client’s room prepped. Have flameless candles, comforts from home like pictures, quilts, etc available so when mom and baby return, they can begin bonding in a comfortable, comforting place. Have an established relationship with a Lactation Specialist who will come to see the family during the immediate postpartum. Mothers who have cesareans sometimes have a delay in production of mature milk- support during these early days can be extremely helpful. Order in a special meal for the couple when mom has been cleared to eat solids. Arrange postpartum support- a postpartum doula who visits mom and helps with baby care during the day after dad returns to work is an excellent idea. While a cesarean is occasionally necessary, there are ways we can make surgical deliveries more gentle and beautiful for the family involved. There are ways we can recognize that this sacred time- when a family is growing- should be recognized for the life event it is. Some practical considerations and efforts to involve the family in their baby’s birth can help the family begin life together- beautifully. 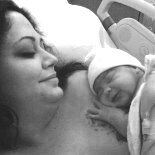 This entry was posted on April 30, 2013 by hearthsidematernityservices in Cesarean and tagged c-section, cesarean birth plan, gentle ceserean.